Baca has contributed a chapter on Flood-aware design to the next (5th) edition of the architects’ reference book, The Metric Handbook. 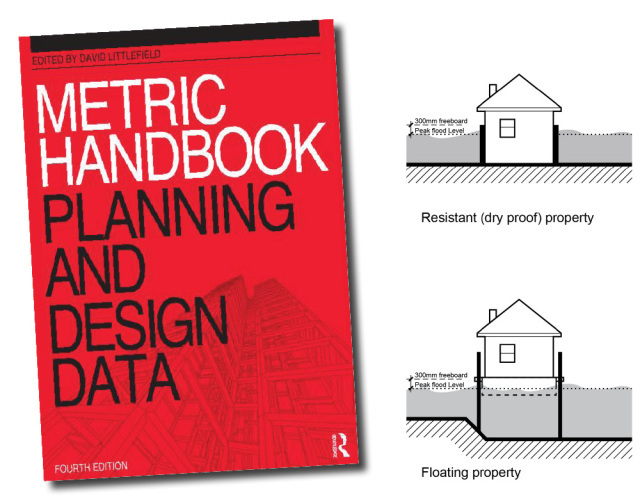 Since its conception, The Metric Handbook has become the major handbook of planning and design for architects. Due to be published in early 2015, the forthcoming edition has been updated to take account of the most recent changes to regulation and practice, in particular the increasing emphasis on environmental legislation. The Practice was approached to apply its expert knowledge of flood mitigation and masterplanning by providing a dedicated chapter on ‘Flood-aware Design’. This will be the first time that such a chapter has ever featured since the Handbook’s debut edition was published in 1968, another indication of the vital need for flooding and flood-aware design to be considered during the planning and design process.